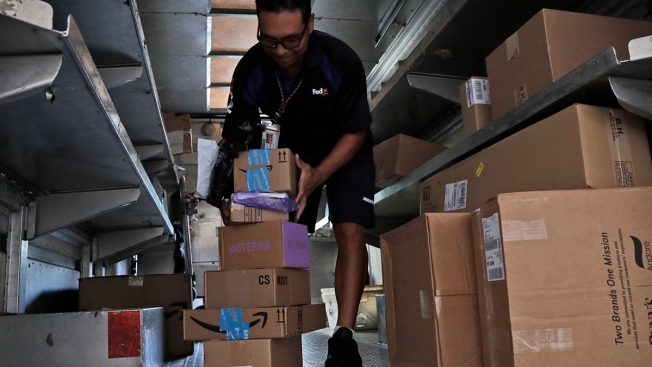 In this July 17, 2018, file photo, a FedEx employee delivers packages in Miami. The United States announced Wednesday that it is preparing to pull out of an international postal treaty that allows China to ship packages to America at discounted rates. The move would escalate a trade dispute with China. President Donald Trump argues that the 144-year-old Universal Post Union benefits China and other countries at the expense of U.S. businesses — making it cheaper to ship packages from Beijing to New York than from San Francisco to the U.S. East coast, which particularly benefits Chinese manufacturers. The officials say the treaty is used by shippers of the narcotic fentanyl to the U.S. from China. The U.S. is willing to renegotiate the treaty over the next year but will leave the union if no agreement can be reached, the officials said. Bishar Hussein, director of the Universal Postal Union, said he regrets the U.S. decision and will seek a meeting with American officials. The move was welcomed by the U.S National Association of Manufacturers, which called the exiting postal pact "outdated" in the age of e-commerce and at a time of Chinese manufacturing dominance. "Manufacturers and manufacturing workers in the United States will greatly benefit from a modernized and far more fair arrangement with China," Jay Timmons, president of the manufacturers association, said in a statement. The U.S. and China are already locked in a trade war. The United States has imposed tariffs on about $250 billion in Chinese goods, and Beijing has responded by targeting about $110 billion in U.S. products. The world's two biggest economies are clashing over U.S. allegations that China is using predatory practices to challenge American technological dominance. These include hacking into U.S. companies' computers to steal trade secrets and forcing American firms to hand over technology to China in exchange for access to the Chinese market. Trump has made a point of cutting America's international ties. His first week in office he pulled the United States out of a trade pact with 11 Pacific Rim countries. He also has left UNESCO and the United Nations Human Rights Council and pulled U.S. funding for the UN agency for Palestinian refugees.